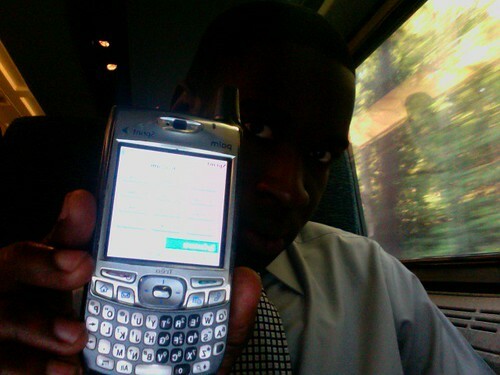 Right now I am on board a train to Washington DC on a business trip and I am on the internet! My Macbook Pro is connected to my Trusty Treo, which is connected to the internet, which leads to a much more productive and excited Geremy. Best part is that it’s all included in my $30/month voice and data plan with Sprint…or at least I hope so. My lack of updates during the last few days is mostly due to my currently pending house purchase transaction. Thanks to my great lawyer, amazing mortgage broker, and even amazing-er real estate agent who is also my real-life dad, I will be closing on my new house next week. There’s also been some pretty exciting (in my opinion) developments in my life, which will be shared with my closest group of friends, which includes all of you fairy-tale people on the internet. For now, I am going to spend my time on the train wisely and draft a few future journal entries…or maybe I might just watch streaming videos on Youtube or view read the current news on NyTimes.com because I can. Wireless cellular internet: Greatest. Invention. Ever!